A year following the release of their second LP Repave, Justin Vernon's Volcano Choir project have attached a video to the album's "Tiderays." 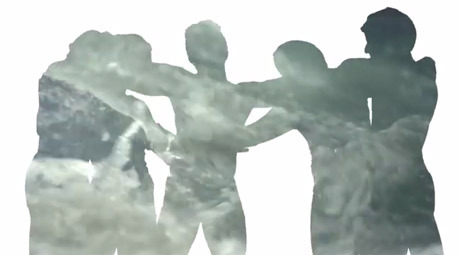 The nicely shot clip, directed by Kyle Buckley and Andi Woodward, riffs on the oceanic vibes of the album's cover, as waves reflecting the colours of the sky pour over rocks and ice in the silhouettes of dancers from the Milwaukee ballet. As the song climaxes, the silhouettes move with more energy, swaying and going kaleidoscopic as the songs churns. The video was created as part of the 551 Project, which you can read about here. Watch the aqueous creation below.